See Kyoto highlights on this 6-hour tour from Osaka! Visit two UNESCO World Heritage sites — Ninjo Castle and Kinkaku-ji Temple (Golden Pavilion) — as you tour Japan’s former capital with an experienced local guide. You’ll also visit the Kyoto Imperial Palace and the Kyoto Handicraft Center, traveling round-trip by train from Osaka. Enjoy impressive displays of the seasons at these landmarks, including cherry trees in full blossom in spring! 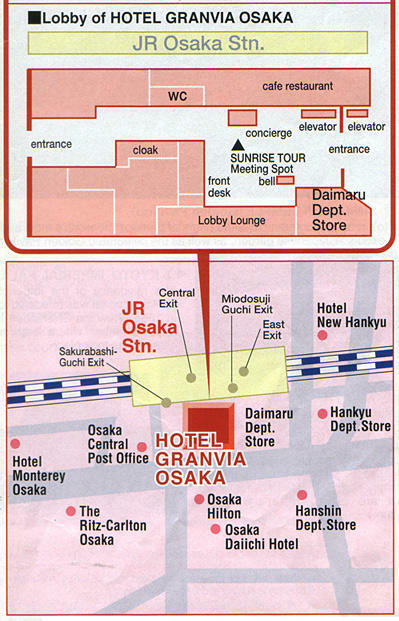 Your guide will pick you up from your selected hotel in the morning and accompany you to the Osaka railway station. Board the JR rapid service train for Kyoto and relax on the 30-minute ride to the former imperial capital. Upon arrival, you’ll disembark and begin your 6-hour tour of the city, where Japan’s emperors resided from 794 until 1868. Your comfortable coach delivers you to top attractions where you’ll hear expert commentary from your guide. Begin at Nijo Castle, a UNESCO World Heritage site built in 1603 to house Tokugawa shoguns for more than two centuries. Observe the solemn appearance of the castle's massive gate and stone walls surrounded by a moat, in contrast with its decorative interiors painted in gold leaf. You’ll find fantastic photo opportunities in any season amid the garden’s plum and cherry tree groves. When Nijo Castle is closed, you’ll visit Ryoan-ji Temple instead.Next, walk around one of the world's most exquisite Japanese gardens at the UNESCO World Heritage-listed Kinkaku-ji Temple. View the revered Golden Pavilion before a visit to the Kyoto Imperial Palace. A residence of the imperial family until the capital was relocated to Tokyo in 1868, the palace clearly shows the Japanese taste for simplicity, purity and tranquility. You'll also view the Shishinden imperial state chamber where enthronement ceremonies took place. When the Kyoto Imperial Palace is closed, the tour will visit Kitano Shrine (Kitano Tenman-gu) instead.Enjoy a buffet lunch (own expense) and some shopping at the Kyoto Handicraft Center before your tour concludes with a return trip by JR rail back to Osaka Station, where you’ll make your own way back to your hotel.